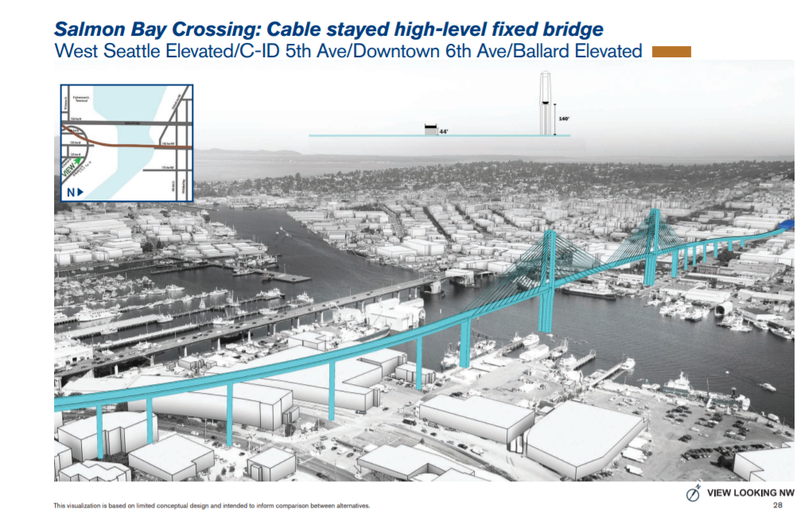 Perspectives from the Doll House: Yes to Light Rail in Ballard, No to an Elevated Line along 14th Ave NW! 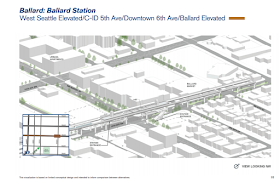 Yes to Light Rail in Ballard, No to an Elevated Line along 14th Ave NW! Hello, Seattle citizens! 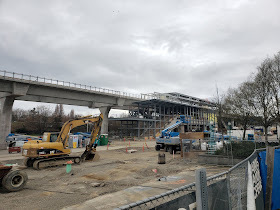 In this post, I will present a synopsis of the light rail options for the Ballard station according to data currently available, and I will articulate why I am so strongly opposed to the fixed bridge and elevated rail line option along 14th Ave NW. Below is a brief summary of my observations, followed by a more in-depth analysis of the current plans, and concluding with a sample letter, should you agree with the arguments I present and wish to have some guidance generating feedback for the Sound Transit scoping process. 1. Fixed bridge over Salmon Bay with elevated tracks on 14th Ave.NW leading to an elevated station on 14th Ave NW straddling Market Street. Several commentators have suggested that this is emerging as the preferred option by Sound Transit! It is worth mentioning that the current light rail budget does not cover any of the above options; it appears that voters only approved funding for options that have since proven to be untenable by Sound Transit. 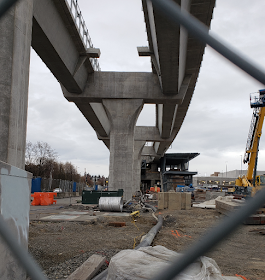 I don’t know where Seattle will get the money for the options; but Sound Transit has estimated that the cost of the elevated line would be $100 million incremental to voter-approved funds, while the underground options would each be $350 million. C. “Tail ends,” tracks that allow trains to turn around, would extend into residential areas north of Market St., ending between NW 57th/ 58th Streets (at 45’ height); this would significantly degrade the quality of life for residents in this area. D. A future extension north to Crown Hill is likely; the elevated tracks would extend north through the residential area of 14th Ave between Market St. and 65th St, before entering a tunnel at 14th Ave. and 65th St, profoundly impacting the 14th Ave residential neighborhood. E. 14th Ave is far from the center of Ballard’s population density, making it the least logical option of all those considered by Sound Transit so far. 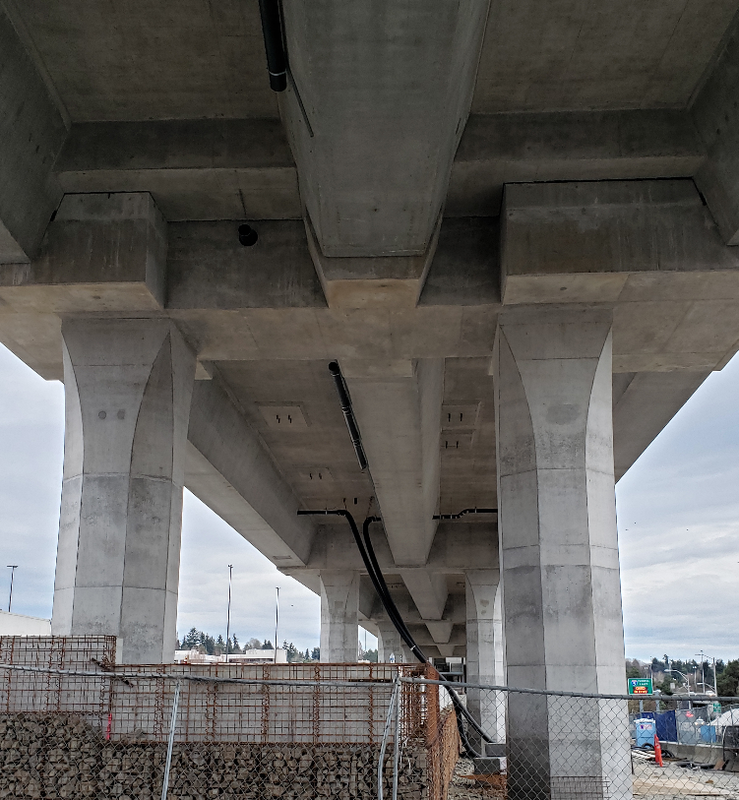 I’ve scoured the web for data and photographed areas of Seattle that offer examples of what life might be like under the bridge / elevated line option. First, a disclaimer: I am in no way an opponent of public transportation; in fact, I consider myself an ardent supporter. I lived in Paris for a year and in Chicago for nearly a decade. Those cities' rail systems are the lifeblood of their social and economic lives, and I was grateful to use them on a daily basis. 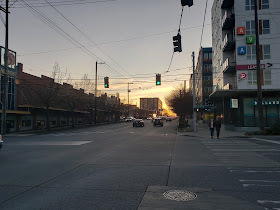 My concern is in no way an opposition to Ballard light rail as a concept; rather, it comes from a sincere belief that the current plans for an elevated link along 14th Ave NW would have disastrous impacts on the neighborhood. Under this plan, trains would start the descent from the fixed bridge over Salmon Bay with one track, which would split into two tracks around NW 52nd Street. It is currently unclear whether the split tracks would be supported with one large support column in the middle of 14th Ave, or two support columns straddling 14th Ave. (See Northgate photos #2 and #3 below for reference.) 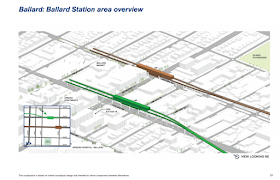 According to east Ballard neighbor Brian LeBlanc’s discussion with a Sound Transit engineer during the February 28th open house, the elevated track plan might close 14th Ave NW from NW 52nd St to NW 57th / NW 58th St to car traffic. If this does occur, cars will be forced onto surrounding roads, increasing congestion along residential side streets and along the already-busy arterials 8th, 11th, and 15th Aves NW. Northgate #1 – Northgate Transit Center station; the station and tracks are 45’ high, as tall as the projected support columns on 14th Ave.NW. Note the extensive construction staging station around the site. Northgate #2 – Split tracks with one 45’ support column leading to the Northgate Transit Center station. Northgate #3 - Track with two 45’ support columns leading to the Northgate Transit Center station. 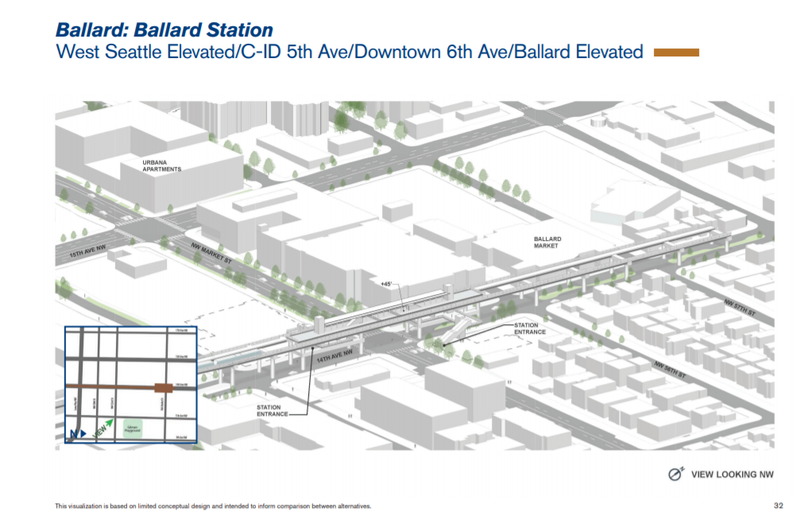 Plans for a 15th Ave. NW elevated station (no longer under consideration), and a 14th Ave. NW elevated station (brown). Note how far the “tail tracks” would extend into the residential area north of Market St.
Plans for the elevated station at 14th Ave NW and Market St. Again, note the “tail tracks” extension into the residential area of 14th Ave NW. Under the current proposal, the station itself would extend from Safeway/MacDonald’s on the south end of Market to the end of AVA Apartments on the north side of Market. Since the station would (at least temporarily) be a terminus, Sound Transit would add several blocks of “tail tracks” to allow trains to turn around or switch tracks. These would extend into the residential area of 14th Ave north of Market St, and would end between NW 57th and NW 58th streets (behind the St. Alphonsus Family Center). 14th Ave. NW, looking south from NW 58th Street. "Tail tracks" would extend from the station at Market Street (at the traffic light in the middle of the picture) to just south of this intersection. Most concerning is a Sound Transit engineer’s admission to Brian LeBlanc that the agency would likely extend the Ballard line north to Crown Hill in future years. If Sound Transit decides to build elevated tracks along 14th Ave NW, an extension would involve continuing the elevated tracks north through 14th Ave (at that point, an entirely residential street), before having the tracks descend into a tunnel at NW 65th Street where 14th Ave meets Ballard High School. It is difficult to see how workers could avoid destroying the newly-created Gemenskap Park, which has quickly become a favored gathering place for the families of east Ballard, during the construction process. In short, building a bridge over Salmon Bay with elevated tracks running down 14th Ave NW would have a devastating impact on the very neighborhood it is meant to serve. “After attending numerous Sound Transit meetings and as members of the Stakeholder Advisory Board, we have studied and reviewed all available options. 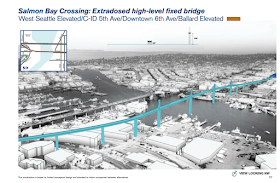 Through careful consideration, we are advocating for a tunnel under Salmon Bay with an underground station in Ballard at 15th Avenue NW and NW Market. - Brian LeBlanc notes that Sound Transit may be hesitant to subject businesses along 15th Ave to the disturbance of construction. Gemenskap Park on 14th Ave NW, looking south from NW 60th Street. 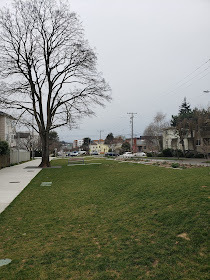 The park has become a neighborhood touchstone, but it is difficult to see how it could be preserved if a rail line were extended north along 14th Ave from Market Street. Note: the area on 14th Ave between NW 58th and 65th Streets is entirely residential. 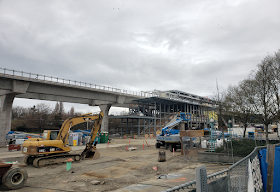 For an idea of the impact the construction process, elevated track lines, support columns, and above-ground station would have on the east Ballard neighborhood, I encourage citizens to visit the light rail extension currently being built along 1st Ave at Northgate Mall. The scope of the Northgate project is appropriate for its location: a busy mall and transit hub near shops and major highways. 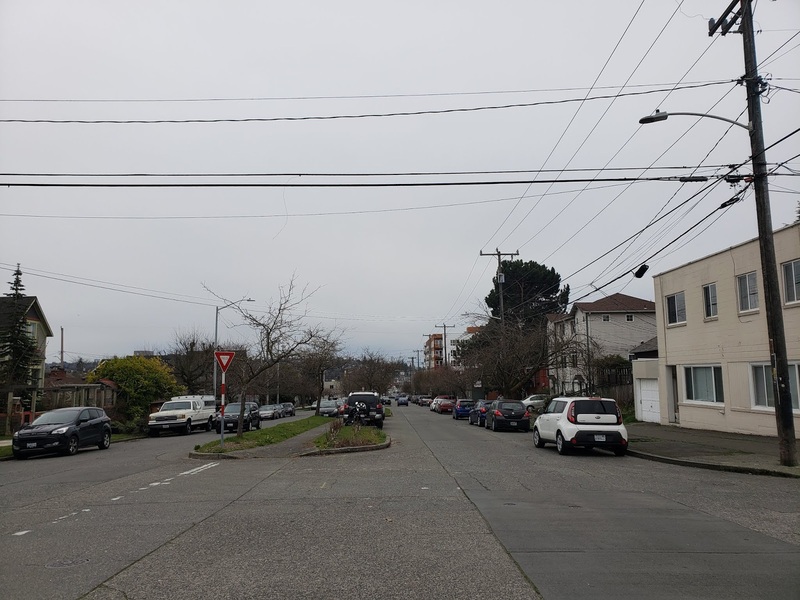 Such massive above-ground infrastructure is entirely incongruous with the smaller buildings along 14th Ave NW, especially the residential ones north of Market St.
"Avalon Tom's" plans of possible light rail design in West Seattle. "Avalon Tom's" rendering of a possible West Seattle rail line. 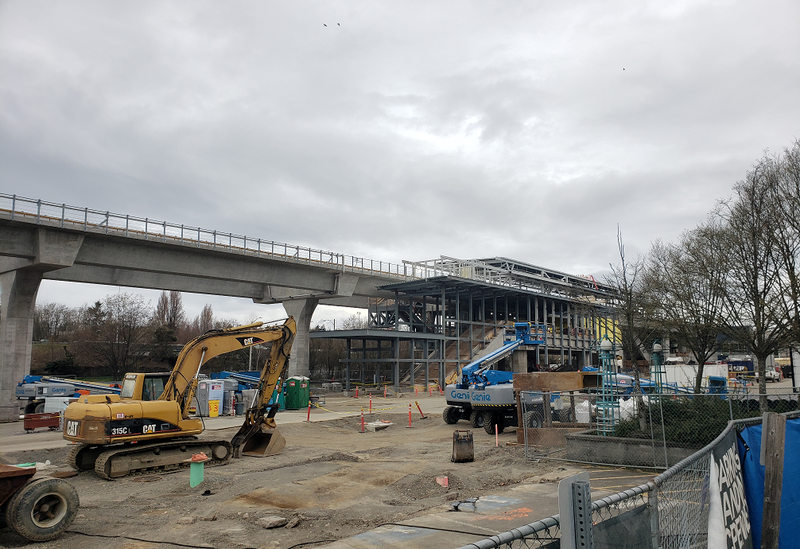 If the proposed Ballard link is placed in an elevated track on 14th Ave. NW and later extended north to Crown Hill, the rails will be in similar proximity to residential units along the route. A tunnel below 14th or 15th Ave, on the other hand, would minimize negative impact on the residents and businesses along the route. Since there wouldn’t be clearance needed for quality of life issues such as noise and traffic, it may even be possible to increase building density along the line and its stations. In addition, a station at 15th and Market could easily connect to future extensions north to Crown Hill and west to the U District. 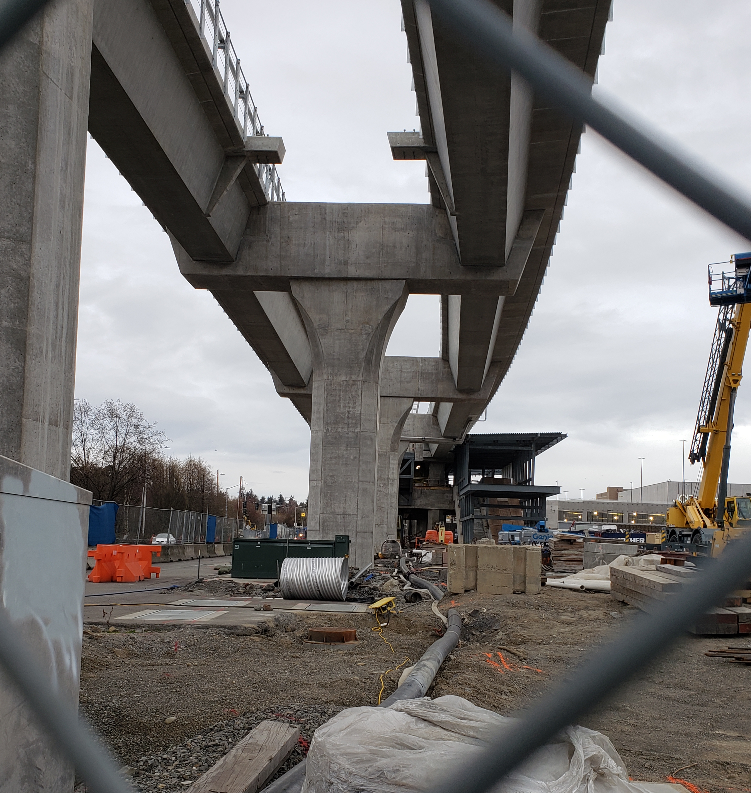 It could also connect with bus stops that currently serve the location, including the north-south 15 and D RapidRide lines, as well as the east-west running 44. "Census tract 47 extends from 8th Avenue to 24th Avenue, and from 60th Street to the Ship Canal. In 2018, the area of the tract west of 15th had 2 ½ times more population than east of 15th. And it has been pulling away. In percentage terms, it grew 4 times as much from 2010-2018 (86.6% vs. 21.8%), and 3¾ as much in the prior decade." Menchhofer estimates that a 10-minute walk from a 15th Ave station would bring a visitor within vicinity of about 60% of the buildings in the Urban Village, whereas a 10-minute walk from 14th Ave would bring the user to fewer than 20% of area buildings. 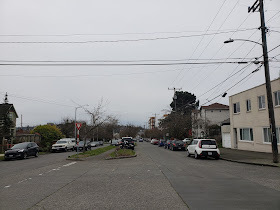 This is a notable concern for people with limited mobility: it would add the distance of two football fields to their walk, and force them to navigate the busy intersection at 15th Ave. in order to reach the historic heart of Ballard. An underground station at 15th and Market would increase safety and accessibility by presumably having exits at all four points of the intersection, reducing the need for transit users and local pedestrians to avoid cars, buses, and bikes at the ground-level roadway. 14th Ave NW and Market St,, looking west toward 15th Ave NW and Market Street; the tall Leva on Market building is just east of the intersection. The distance between 14th and 15th Aves is about the length of two football fields. In short, I believe that the arguments for a tunnel under Salmon Bay and a station at 15th Ave NW outweigh all arguments against it. I strongly encourage Seattle residents to give their feedback to Sound Transit before the April 2nd public commentary deadline. 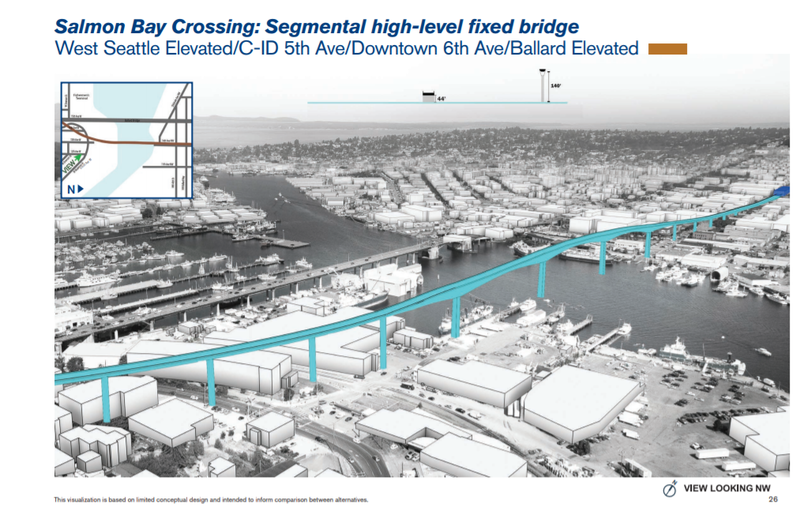 I am opposed to the Ballard light rail option that would place the route on a fixed bridge over Salmon Bay, on elevated tracks on 14th Ave NW between NW 42nd and NW 58th Streets, ending at an elevated station at Market Street. This option would result in infrastructure entirely out of proportion to the neighborhood, especially the residential area north of Market Street, where "tail tracks" would extend beyond the Market Street station. It may also result in closing or restricting portions of 14th Ave NW to traffic between NW 42nd and NW 58th Streets, pushing vehicles onto already busy arterials and clogging surrounding residential streets. If the line is extended north to Crown Hill in the future, an elevated line along 14th Ave NW would run through the almost entirely residential area between Market Street and NW 65th Street. This would result in disruption and possible displacement for residents in the path of the extended line, and neighbors in surrounding blocks risk having their quality of life eroded by blocked light and noise. 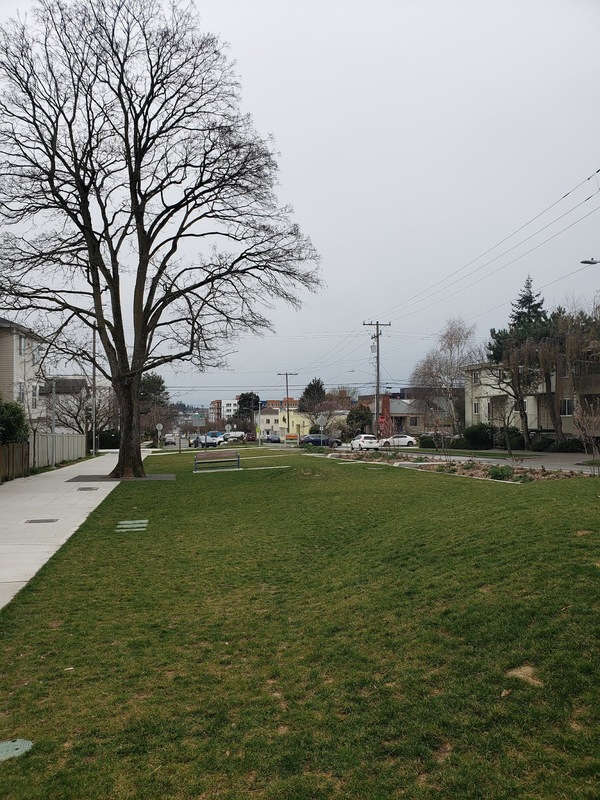 It would also destroy the newly-created Gemenskap Park, which is becoming a recreational touchstone for east Ballard families. A tunnel under 14th or 15th Ave NW would be a more expensive option upfront, but would better fit with residents' vision for the neighborhood. Once completed, it would result in minimal disruption to local businesses and residents. 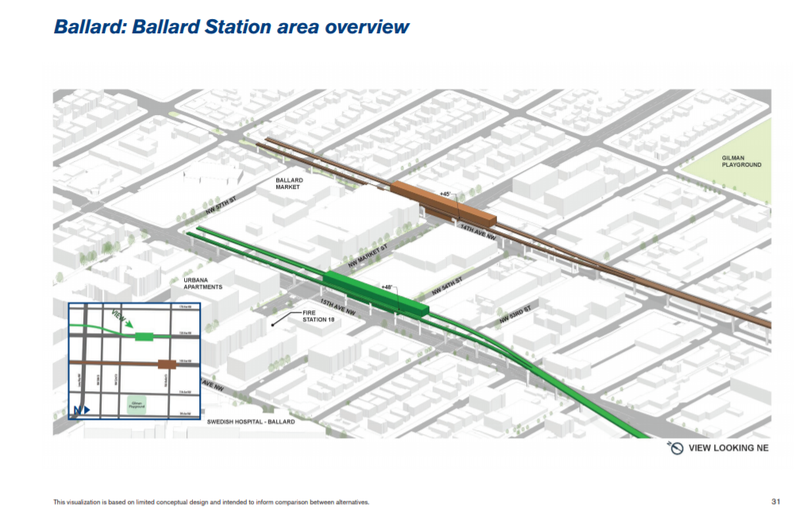 An underground station, particularly at Market and 15th, would more easily connect to current transit options, and would set Ballard up to for future rail extensions to the U District to the east and Crown Hill to the north. An underground station at 15th Ave NW would divert riders and pedestrians away from the busy ground level intersection at 15th and Market. It would be more convenient for Ballard residents, better serving the dense Urban Village west of 15th. 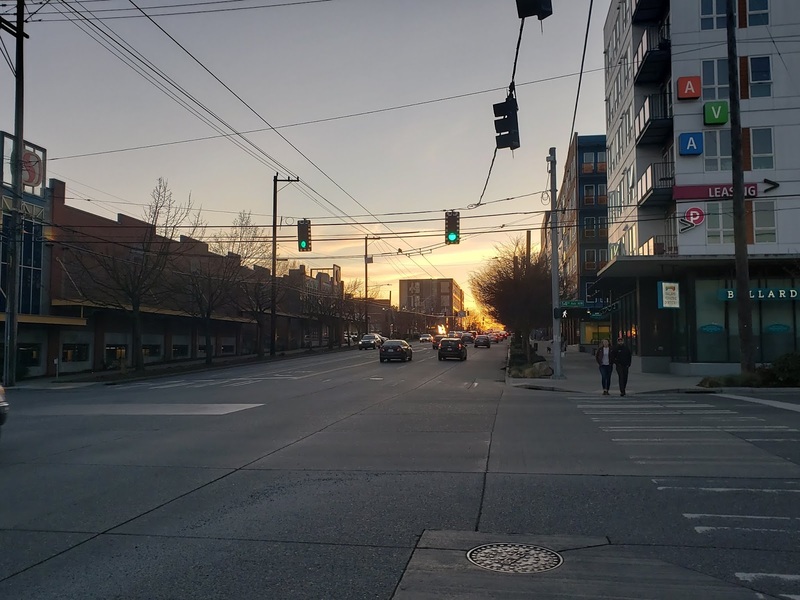 It would also be more convenient for riders, most of who come to the neighborhood to patronize the shops, restaurants, and bars in the core of historic downtown Ballard. In short, an elevated light rail system crossing at Salmon Bay, running down 14th Ave NW, and ending in an above-ground station at Market Street would have a devastating impact on the very neighborhood it is meant to serve. I encourage Sound Transit to consider an option that would be less to disruptive to the neighborhood, such as a tunnel under Salmon Bay leading to a subterranean station at 14th or 15th Ave NW. 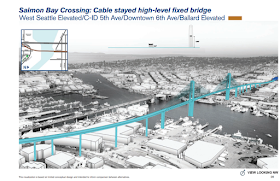 - "What MIGHT Elevated Light Rail Look like in West Seattle? See One Reader's Unofficial Interpretation" on the West Seattle Blog, featuring drawings by "Avalon Tom" imagining the impact proposed light rail lines might have on the community. About the author: Kristin Doll lives in east Ballard with her husband and two cats. She is a member of Friends of Gemenskap Park and the East Ballard Community Association. She can often be seen at Ballard Coffee Works, where she is working to finish a Ph.D. in medieval studies. When her degree is complete, she hopes to teach at the university level in the Seattle area. Graduate student finishing a Ph.D. and hoping for that ever-elusive job in academia!